This was the 5th Cedefop seminar in cooperation with the rotating EU Presidencies. These events build on Cedefop research and analysis and address issues relevant to European debates on VET and employment. Over 50 participants attended, including representatives from EU institutions (European Commission, European Parliament, European Economic and Social Committee), the Permanent Representations in Brussels and major private (IBM) and international organisations (OECD). 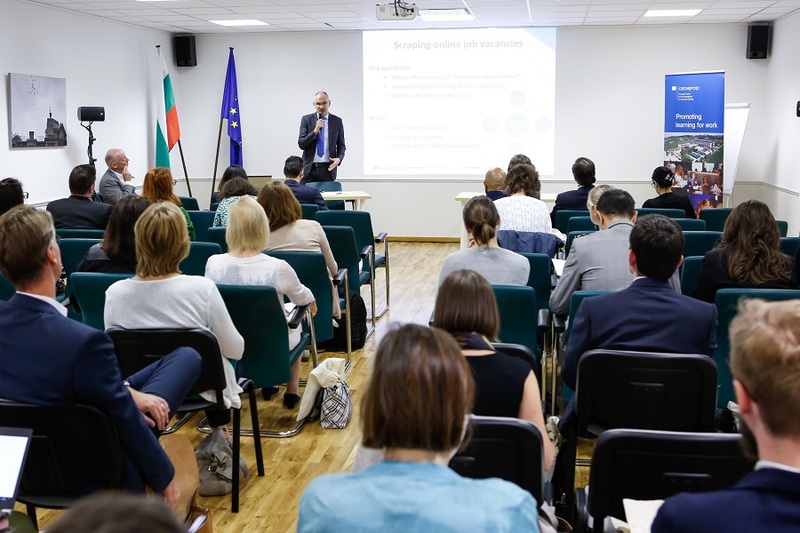 The seminar focused on the extent to which labour market and skills information (LMSI) systems can inform VET and employment policies in EU Member States. It provided an overview of new developments in artificial intelligence (AI)-based data analytics, which may contribute to faster and better skill needs identification and matching. The opportunities and marked challenges for policy of such new data analytical instruments, reliant on big data and/or AI methods, were highlighted in the discussions. The advent of machine learning and algorithmically-powered tools for collecting and analysing trends in skills needs and training opportunities has recently raised high hopes. They are expected to help improve skills anticipation and matching capabilities and diagnostics in countries and enterprises. However, AI-based skills matching algorithms are more likely to be influenced by systemic and inherent biases and misconceptions in their predictive capabilities. Using the outcomes of such instruments may lead to misguided policy decisions and undermine quality assurance in VET provision if they are not placed in the right (institutional) context, or if specific skills governance processes, such as social dialogue, are not in place. After the opening by Yasen Gyurov on behalf of the Bulgarian Presidency, Cedefop’s Alena Zukersteinova and Konstantinos Pouliakas gave a joint introductory presentation. They highlighted Cedefop’s recent focus on the increasing use and value of big- or AI-based methods for skills analysis and policy as part of its new digitalisation and future of work thematic activity. With its assisting EU countries in skills matching country support programme, Cedefop has also been working closely with EU Member States to build better and more responsive skills anticipation and matching systems. The first session discussed the future of data analytics for skills and skill needs. In his keynote presentation, Cedefop’s Jasper van Loo outlined the agency’s work on big data analysis from online job vacancies, which scrapes online vacancies to detect skill trends in EU countries. He pointed out the opportunities and challenges of using this type of data for policy-making and the critical role of the human factor – the man in the loop – for correctly interpreting and using such data for the purposes of policy-making. The Vice President of IBM’s Global Workforce Policy Division David Barnes focused on how big data and AI are used by IBM for the purposes of solving the skills equation, equipping workers for job/career transitions and empowering them to take control of their careers. In the follow-up session on big data for skills matching, Eric Klewais of the Flemish public employment service (VDAB) showed how artificial intelligence and deep learning methods can be used to better match jobseekers to vacancies, predicting the risk of job placement of a given jobseeker or jobseekers’ reaction to caseworkers’ guidance activities. Claudia Plaimauer (3s, Austria) reported about a pilot project performed on behalf of the Austrian Public Employment Service: testing vacancy mining for validating and supplementing Austria's labour market taxonomies. She underlined that vacancy mining proved to be a highly effective method for identifying evidence-based amendment needs; nevertheless AI-based methods currently can only complement but not completely replace existing editorial methods in taxonomy management. OECD’s Fabio Manca gave an overview of how to blend ‘subjective’ traditional LMSI tools with emerging methods of skills anticipation and showcased the OECD’s skills-for-jobs database. He presented reassuring evidence that the latest methods of identifying skill shortages in economies, relying on conventional data sources, are positively correlated with emerging skills as predicted by cutting edge machine learning techniques.